Restaurants have been lying to you. While they claim lobster rolls are 100% lobster, or that a seafood sub is 100% seafood, that often isn't the case. Frequently, many seafood dishes are made with something called surimi seafood -- a gel made primarily from Alaska pollock that's been processed into other kinds of seafood. Due to global warming, fewer and fewer fish are being caught by fishermen. Could surimi seafood be what the world turns to in order to address our lack of literal fish in the sea? Not everyone is a fan of the fish gel, considering it's a highly processed food that could be considered unhealthy. But since you probably ate it the last time you had sushi (and it'll likely become even more common in the future), it's time to learn about this fascinating, ubiquitous ingredient. What the hell is surimi? You may not have heard of surimi before, but you may know it under its most popular name: "imitation" seafood. To call it that is actually misleading. If a comedian imitates Robert De Niro, he's not actually De Niro, no matter how perfectly he says, "You talkin' to me?" But surimi is not imitation seafood -- it's actual seafood! It is typically made from either Alaska pollock or Pacific whiting, according to studies from the Oregon State University Seafood Lab. The fish is run through a complicated manufacturing process and turned into a gel. Depending on how that gel is processed, it can be used as a substitute for a number of types of seafood, including lobster and crab. Surimi seafood was initially created by Japanese chefs hundreds of years ago, who saved any extra fish they couldn't use by salting and grinding it into a gel. This isn't a new phenomenon, either -- the Japanese have considered it a delicacy for 900 years. In the 1960s, a Japanese chemist figured out how to preserve surimi with sugar, giving it a long life span, which officially kicked off an entire surimi industry. It's not just a Japanese industry today -- there are plenty of fisheries (as in, places where farmed fish are raised) on the Oregon coast too. They manufacture about 200,000 tons of surimi per year, according to Dr. Jae Park, a food scientist at OSU. Its popularity is likely tied, in part, to the fact that it's cheaper than the other kinds of seafood it can be made to taste like; Fooducate estimates that surimi costs around 20-30 cents per ounce. Lobster meat is around $3.12 per ounce based on current market prices. It's basically the cubic zirconia of the seafood game. Surimi seafood is in more dishes than you think. It's one of the main ingredients in Subway's Seafood Sensation sub. You'll get the sensation it's mostly not crab! According to SeafoodSource, the sandwich is 10% real crabmeat and 90% surimi made from Alaskan pollock. Some non-chain restaurants are also sneaking surimi seafood into their dishes by hiding it in "lobster" rolls. 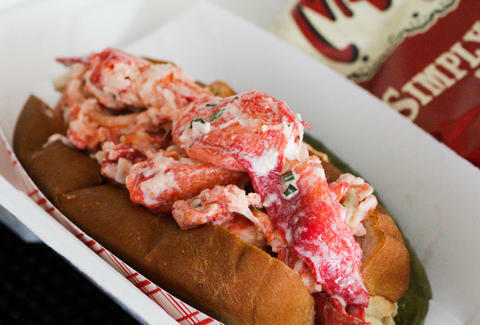 One place you weirdly won't find surimi seafood being passed off as a lobster roll? McDonald's! We know you're going to need a moment to let that sink in. We can wait. And if you've ever had a California roll, you probably know that the "crab" in there is not actually crab -- it's often called crabstick. And crabstick is 100% surimi seafood. While it's easy to raise cattle for hamburgers... farm-raised crabs? Not so much. "There really isn't much in the way of aquacultured crab out there," says Paul Greenberg, author of American Catch, "and so faking the crab is easier than growing it." Greenberg also sent over this hilarious clip about fake crab from Curb Your Enthusiasm, which makes this story more fun to read by 1,000%. Not everyone agrees if surimi is wholesome, but Dr. Park says that surimi has many health benefits. It's high in omega-3's, which aid in weight loss and help fight inflammation. When the fish is processed into surimi, it does lose the omega-3's naturally found in pollock, but pollock omega-3 oil is added to crabstick before it goes into your sushi. He also says it's a low-fat food, and depending on the brand of surimi seafood you're eating, it could be high in protein. Dr. Carl Safina, the president of The Safina Center and a conservationist, isn't as enthusiastic about surimi. "If we could know for sure whether Alaska pollock [a fish considered well-managed and sustainable] is what surimi seafood is made of in all instances, it would be easier to comment on it," he says. "I personally avoid it. Most seafood is not highly processed, but surimi is an exception." He adds that processed foods are potentially harmful for your body. Regardless of its health benefits, the rest of the world, including France, Thailand, and Spain, doesn't just eat surimi seafood in sushi. In South Korea and Japan, it's consumed as part of a fishcake, which is like a croquette filled with, you know, fish. Dr. Park says about 600,000 tons of fishcake are consumed just in those two countries, compared to about 3,000 tons in America, where it's primarily purchased from local Asian markets. In an article on Park's Surimi School, Peg Herring (yes, someone writing about seafood has the same last name as a fish!) notes all the different ways surimi is consumed around the world: In Thailand, they prepare surimi seafood in a spicy dish served with onions. In Spain, you'll find squid ink-colored surimi seafood cut into black eel shapes. And in France, it's served in crabstick form with a slew of dipping sauces. Surimi: the Swiss Army knife of seafood. If you've been to a restaurant or a supermarket lately, you know that sustainability is a big deal in the seafood industry. Overfishing is rampant, global warming may shrink the number of fish caught, and the World Wildlife Fund believes that by 2050, millions of people around the world may not be able to afford fish. 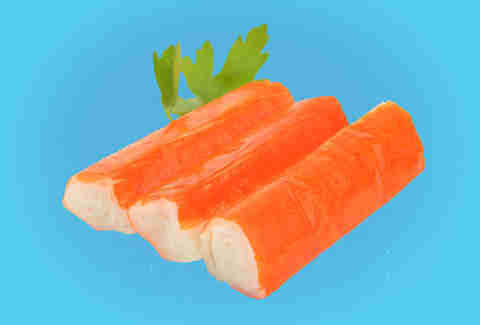 Surimi seafood is a relatively cheap, sustainably produced food. Dr. Park offers many creative ways to use it. 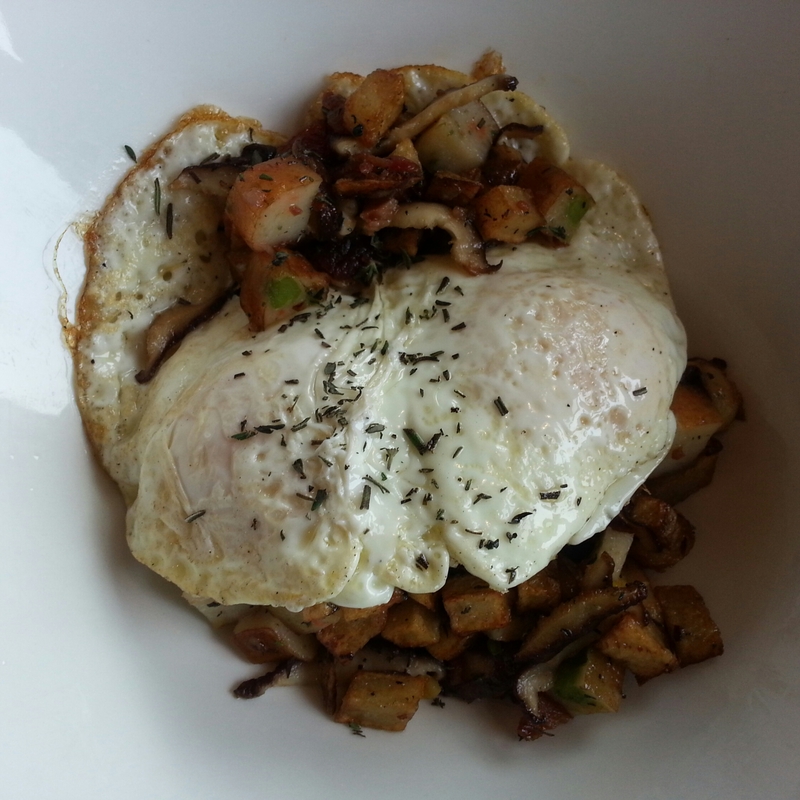 "At my annual Surimi School breakfast, we serve fishcake hash," he says. "Fried fishcakes are used instead of diced potatoes." (Look at the photo -- they look exactly like potatoes.) He's also working on surimi-filled Prottuccini (a combination of the words "protein" and "fettuccini") that resembles wheat-based pasta. And he developed a gluten-free surimi pizza, where the dough is swapped out for everyone's favorite seafood. While surimi seafood might have its downsides (like the fact that it's highly processed), eating crabstick instead of actual crab -- and not just in sushi -- is already widely accepted. It's expected this trend will continue. Seafood likely won't always be plentiful and affordable. That's a possibility you should come to terms with, though it shouldn't be too much of an adjustment -- you've probably been eating surimi seafood for a while without even knowing it. Lee Breslouer is a senior writer for Thrillist, and is down with crabstick. 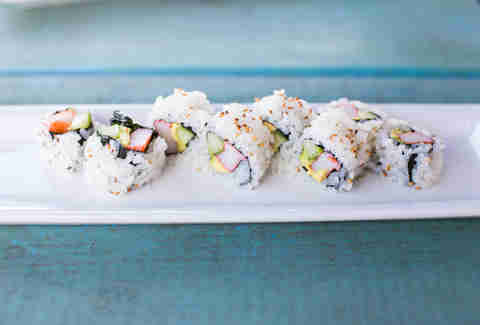 Follow him to California rolls @LeeBreslouer.